Heard of the 'Black Death' in engines? 07 Sep Heard of the ‘Black Death’ in engines? Rather an ominous topic but one in need of discussion! The Black Death ‘health’ pandemic resulted in the deaths of an estimated 75 to 200 million people in the years 1346–53! The ‘Black Death’ we are referring to is the name that has been given to the oil sludge epidemic that choked thousands of engines worldwide in the 1980s – well, it’s made a comeback! Black Death occurs in engines from engine oil gelling or solidifying at temperatures usually lower than 100 degrees Celsius. This causes black ‘sludge’ or gel building up in an internal combustion engine causing problems that, when severe, may require the engine to be replaced. Black sludge build up is usually caused by poorly designed or defective crankcase ventilation systems, low engine operating temperature, faulty injector seals or the presence of water in the engine oil. Lack of maintenance, in particular engine oil changes or using incorrect engine oil in your vehicle can contribute to this issue. Engine oil is the lifeblood of your car’s engine – select it carefully. There are so many different engine oils on the market today it is difficult to know what to use. We recommend referring to your manufacturers service books, you’ll find the correct oil specifications required for your cars’ engine. Heat is absorbed and removed from the engine, preventing hot spots and deformation, warping and failure of moving parts. We have seen a number of Mercedes Sprinter and Vito vans where injector seals had failed, causing engine oil to ‘spray’ into the head cavity and cause heavy sludge build up. So much so that the sludge has to be ‘chipped’ away in order to access the injectors to rectify the fault. More often than not the injectors are in need of replacement once the sludge has built up to the extent that they are buried in sludge. We were once presented with a small hatchback car, the client had not serviced the car for 90,000kms! The car had been driven every day and was reported to feel ‘sluggish’. Upon inspection we found the engine heavily ‘sludged’ up and we recommended NOT completing a service as engine damage would occur. As the sludge build up was extreme, completing an engine flush would have cause more problems, especially if pieces of sludge had broken away, lodging in other parts of the engine causing it to fail. Example of sludge build up as a result of failed injector seals. The client did not proceed with a service however, we were informed later that the car had been left stationary for 3 months, which had allowed gravity to pull the sludge to the bottom of the engine, the sump, blocking the oil pick up valve and starving the engine of engine oil. The result? A failed engine. Although that is an extreme case, it’s really important to maintain car servicing to avoid engine damage and sludge build up. 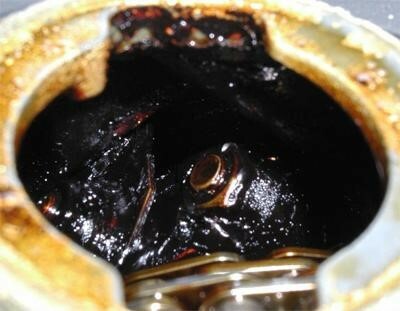 Here’s an example of the appearance of ‘black sludge’ on a BMW engine photographed from the oil filler cap. If you are concerned about your car’s engine, call into SVS Autocare for a no obligation discussion. One of the team would be happy to help.